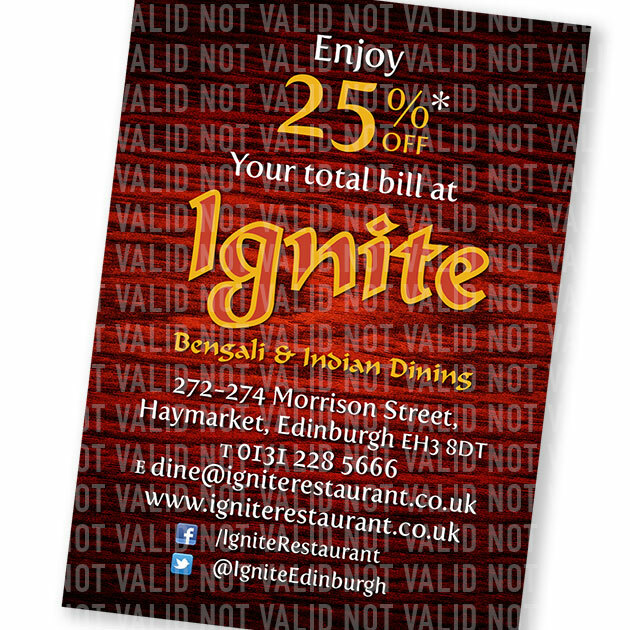 If you dine regularly at one of the best Indian restaurants in Haymarket, Edinburgh you can expect to receive a discount card that entitles you to 25% off our a la carte Bengali and Indian menu and drinks at Ignite. *25% off your total bill including drinks. Sit in only. A la carte menu only. Not valid for rugby match days. Not valid for our lunch menu. We reserve the right to withdraw this offer at anytime. To reserve your table call 0131 228 5666 between 11.00 and 23.30 or via the form opposite and have your booking confirmed instantly.